The accepted origin of the term chaplain goes back to a story of St. Martin of Tours tearing his cape in half and sharing it with beggar shivering in the cold. This he did in obedience to the teachings of Jesus to share your coat with one who has none. After Martin’s passing, French kings kept the remnant of that cape, called a capa or capella, with them in military campaigns as something sacred, a holy relic, imbued with power. The tent holding the remnant became known as the capella and its custodians became known as capellani. This term developed through the term chapelain in Middle English to the term chaplain in modern English. While contemporary chaplains no longer are in charge of physical relics, they are very much caretakers of the sacred…the holy…the divine image in each person within the institutions they serve. Chaplains generally are found in settings where the experience of humanity is often stretched and frayed and access to more common spiritual resources is limited. Chaplains remain a witness to the holistic, higher, transcendent character of each individual…and to the immanence of how each person experiences their God likeness right where they presently are. Chaplains are to be “in” their respective institutions but not “of” them. Their perspectives must be drawn from outside the more common reference points of their institutional co-workers. They strive to reconcile the experiences of their community to a higher ground so as to witness to the lifting of what often passes inside the institution for the ordinary. The work of grace is to make the ordinary…extraordinary – and to witness the sacred character of each individual. To nurture this change, this metanoia, chaplains become sensitive to the variety of ways individuals may come to experience grace. Chaplains need to take care to not just project their own experience onto others, or to limit other’s exploration to the confines of the chaplain’s own personal comfort and familiarity. I found that each assignment afforded me new opportunities to affirm the holy and sacred, and to expand my own horizons as to the largeness of grace and how it works in people’s lives. In the first half of my career I was assigned to working with basic and officer trainees, young troops overseas separated from spouses, and family ministries. My first assignment was at Lackland AFB in San Antonio, Texas. 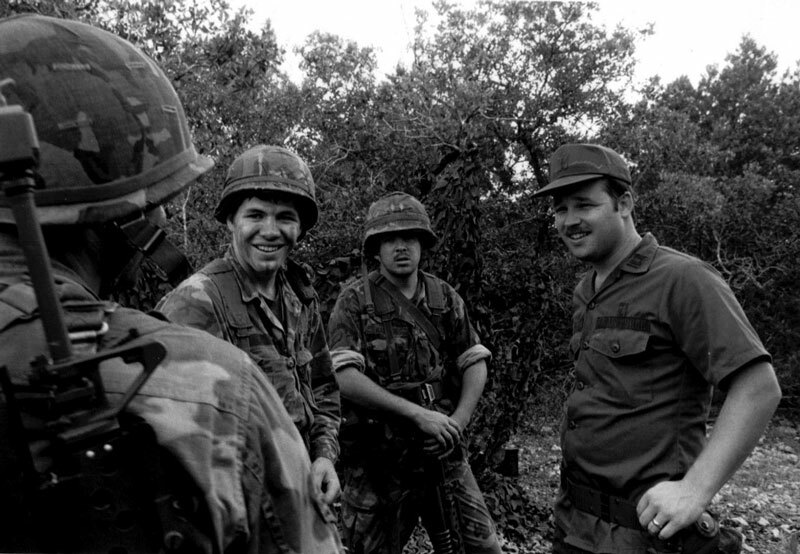 Here I am visiting Air Force Security Police during a week-long field exercise in the Texas Hill Country. I worked with military police from the Marines as well Air Force, while conducting worship, counseling, and values/ethics education at Basic Military Training and Officer Training. 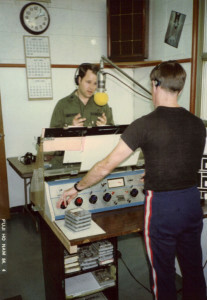 While assigned to Kunsan AB in the Republic of Korea, I started doing a Friday “drive time” radio show on Friday night as people got off work and moved toward their Friday night activities. This show was called “The Sound of Peace and Life” and mixed spiritual messages with contemporary Christian and popular music. The program was connected to a coffeehouse ministry I ran called the Son Light Inn and a mixed Sunday evening “Country Church” service of made up of a young adult audience of half Baptists and half Pentecostals. Everyone at this assignment was away from their family, including me, for the twelve month tour of duty (we did get one month of leave during the year in which we could visit back home). There is a saying that when troops leave their home base to go on “temporary duty” (TDY) that what goes on during TDY remains there when returning home…it is to remain a secret. In the Pacific, no one could remember a flying unit wanting to bring a chaplain on a TDY…let alone spend their own money to bring him. 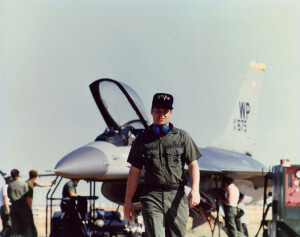 My F-16 squadron in Korea was the first in memory to want to do so. They were a wonderfully raucous group, who I dearly loved. Here I am visiting the aircraft maintenance personnel on deployment during an exercise in northwest Australia. While assigned at Mather AFB in Sacramento, California my primary responsibility was supervising the Protestant ministries at a large family chapel. 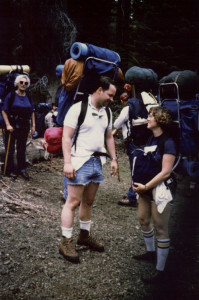 I also worked with single airmen and led backpacking spiritual renewal trips into the wilderness areas near Lake Tahoe. I am pictured here with my wife Jerri (and daughter Bethany in the pouch on her stomach). In the second half of my Air Force career my witness broadened to more consistently address organizational and institutional issues, patterns of reasoning, values, and ethics at leadership and policy levels. During the First Gulf War I was representing the Chiefs of Chaplains in all three services as Coordinator of Religious Broadcasting with the Armed Forces Radio and Television Service (AFRTS) Broadcast Center in Los Angeles. In this position I was offered a global ministry, contact with every major broadcast ministry in the nation, and served as the principal advisor on free exercise and other religious issues for the assistant Secretary of Defense for Public Affairs. The position also afforded me a few opportunities to make some broadcast remarks on freedom, peace, and justice. Selected to lead the Air Force’s largest Protestant program and staff in Europe at Ramstein AB in Germany, I developed what our inspectors from the European Command assessed as an impressively comprehensive, effective, and widely diverse variety of Protestant offerings…while also protecting the free exercise rights of new religious groups like the Wiccans. I was chosen as the only chaplain of my rank to attend the Air Force’s senior service school in residence (a place where they send leading people from the U.S. and allied military). In this setting I had opportunities to engage senior decision makers in their thinking and leadership. I enthusiastically engaged the post-Cold War discussions and exercises and was honored to graduate from the Air War College at Maxwell AFB in Montgomery, Alabama, in the top 25% of my class…something that the College faculty had never seen a chaplain accomplish. My final assignment was as Senior Chaplain at Tyndall AFB in Panama City, Florida. 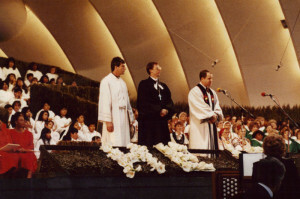 Hosting and speaking at a segment of the ecumenical Easter Sunrise Service at the Hollywood Bowl televised internationally following the fall of the Berlin Wall and the granting of new freedoms for religious expression in Eastern Europe. I gave the opening prayer and some guidance on how to pray at an Interfaith Prayer Service at Robert Schuler’s Crystal Cathedral preceding the start of ground operations in the First Gulf War. The Vice President spoke also. The service was telecast live and again on a segment of the Hour of Power television program. Dr. Schuler invited me back to lead prayer at Sunday worship services. 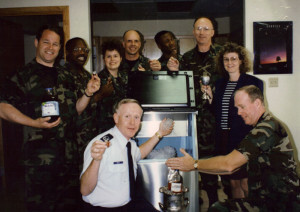 Posing with my staff for a thank you picture for a general who had secured a much-needed ice machine for us. While serving as Senior Chaplain at Tyndall Air Force Base in Panama City, Florida, I was responsible for three Protestant and two Catholic congregations and the free exercise of religion rights of everyone on base. I retired from this assignment as a Lieutenant Colonel after 17 years of service on three continents. 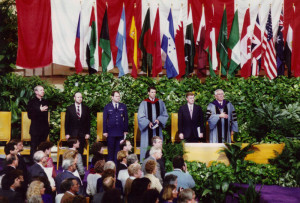 In the video, you may note the cycle of church worship from a Christmas eve candlelight service through an Easter sunrise service, the locations for ministering to our community including F-16 hangars, the Vacation Bible School experience for the children of those assigned to the Wing, the preparations for our troops deploying, a joint Catholic-Protestant celebration of a Passover Seder, baptisms, and the joy and fellowship of a diverse community celebrating together.